Bewcastle churchyard, south of west end of church. 440 cm in height, 56 cm tapering to 40.5 cm in width, and 54 to 28 cm in depth. 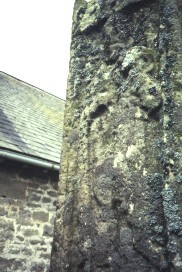 View of top of west face of stone shaft, dated to the first half of the eighth century. This figure is enclosed in a square-headed panel, edged on three sides by a fine roll moulding, and is facing out. He has a lamb in his left arm and his right hand emerges from a fold of drapery and seems to be pointing across his body to the lamb. The lamb is haloed, and its face is turned towards the viewer. The human figure does not seem to have a halo, and is male as there are surviving traces of a beard and moustache. Bailey, R.N., Cramp, R.J., Corpus of Anglo-Saxon Stone Sculpture. Vol. 2, Cumberland, Westmorland and Lancashire North-of-the-Sands 1st, Oxford University Press, Oxford (1988) Anglo-Saxon, Sculptures, Crosses..